In part one, we looked at the first three values every parent should teach their children to raise them as firm believers. We spoke about instilling confidence, responsibility, and optimism into the hearts of children, and discussed the importance of these values in Islam. Now, it’s time to look at the next four core values to raise firm believers – faith, strength, leadership, and action. Let us take a close look at each of these values and why they are important to instil in our children. When we hear the word “slave”, we immediately think about brutal detention camps or workers labouring to build tall structures for rich countries, or children working in factories of developing countries. But have we thought the first pillar of Islam which says, “I bear witness that there is no one worthy of worship except Allah and I bear witness that Prophet Muhammad is His slave and His Messenger”? When a person prays five times a day, this phrase is recited in each prayer. So it is important to define what a slave truly is. In a nutshell, a slave is someone who does whatever his master tells him. He works for the master 24 hours a day, 7 days a week. He does not take time off or ask for compensation from his master. An employee, on the other hand, works for his or her employer, takes time off on weekends, takes vacation days, demands a salary, and can quit if he finds a better employer who will pay him more. A slave, on the other hand, can only be freed at his master’s will. S/he does not own any property and does not plan for herself/himself. A slave always gives his/her best to please his/her master, whatever the circumstances may be. If we want to raise a firm believer who is dedicated to bringing change in society, then we need to mold him/her to have the mindset of a slave – a slave of the Creator of the heavens and the earth, and not a slave of this world. It is an honor that Allah created us and gave us the opportunity to serve Him as His slave. Let us not neglect that we are living our life according to the terms of our Master. Our part is to find out what our Lord wants from His righteous slaves. That can only be done by following His guidance from His book and the messengers He sent down. If we can correct this concept in our minds, life will be a lot easier, happier, and more satisfying. We will always be grateful for what our Master has given us. And if He takes something away from us, we as slaves will know that it was not ours as He is the One who created us and knows what is the best for us. This means the strength of faith, steadfastness and perseverance. We can also learn that, for a Muslim who wants to bring change, it is essential to also consider taking proper care of the fitness and strength of the body and not to neglect this dimension. We can talk all day and make beautiful speeches, but action requires us to have a body with strength. Our goal is to be closer to Allah and Prophet Muhammad is teaching us to be a strong person. It will also require us to change our whole life; what activities we do, spending thirty minutes to an hour out of our day to exercise, and eating right, which would mean controlling our habits during iftars and wedding parties. As parents, we need to make sure that we have a culture of an active lifestyle at home. We revolve our family gatherings around outdoor activities instead of sitting in front of a screen. Choose an activity that you can do as a family (walking, hiking, playing football in the local park are just a few examples) and schedule them into your weekly planner to do as a family. Not only will it make you physically strong, but it will strengthen your relationship too. For those of us who were not born in the West, and migrated from the Middle East, South Asia, or any other parts of the world, our hearts are usually attached back home. We will always be talking about how great people were back home and how this society is so bad. But we also do not want to leave this so-called “land of the Kuffar”. It is obvious that our life is a lot more comfortable here than it was back home. Then why the double standards? If we want to see a change in society – the home for us and our future generations – then we must start thinking like we are a part of the society. The only way to bring change to “Our People”, in sha Allah, is to start considering ourselves as one of them. We cannot be a leader when we believe that we are outsiders. Wherever we live, we must have a mindset of leadership and encourage our kids to have a sense of leadership in their role as well. We must always look for opportunities to make the lives of people around us better. That is what true leadership is about and our children must learn this attitude. When we consider ourselves spiritual and the “men and women of God,” we think we need to become monks who sit on their prayer rug with prayer beads and do dhikr (remembrance of Allah ) all day, especially in time of struggles and difficulties. All of that is fine as long as we are spending our time making sure we have done our part. We need to first and foremost put our trust in Allah , as long as we have ‘tied our camels’. This term comes from a story where a companion of Prophet Muhammad left his camel without tying it. Part of our faith is to know and teach our children to trust Allah in every situation. But we need to do the necessary action too, as the hadith implies, and our children must know that. They should not be spoon-fed everything and they should take ownership of their matters as they mature in age. 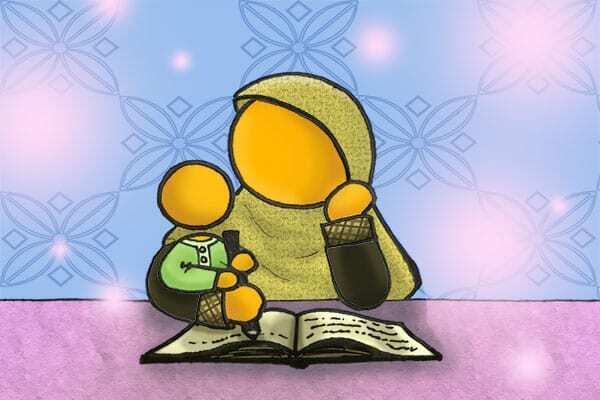 We need to study for our test, and then put our trust in Allah to pass. Take the pill, and then put our trust in Allah to cure us. Work out and eat healthy, and then put our trust in Allah to give us health and strength. Buckle up and drive safely, and then put our trust in Allah to keep us safe. We need to work hard, make a living, spend in the cause of Allah , and then put our trust in Allah to eliminate poverty. I think we got the point! This brings us to the end of our two-part series, alhamdulillah. Confidence in Islam, optimism, responsibility, faith, physical strength, leadership and action seven qualities we need to instil in our children, to make them productive individuals of the Ummah. As we said before, it’s never too late to start – have sincere intentions to establish these values within yourself, and you will slowly see them reflected in your children, in sha Allah. What suggestions do you have to inculcate these values effectively among children? Share them in the comments to benefit others also.